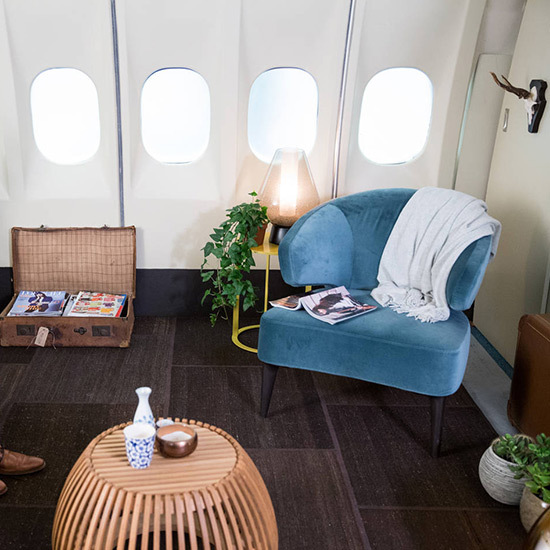 Dutch airline KLM retired one of their commercial airliners and they've retrofitted it as a Mid-century modern apartment, open to a select few guests through Airbnb. Unless you can afford to shell out for first class, sleeping on planes is usually something to be avoided at all costs. But what if you were the only person on the aircraft? Dutch airline KLM recently retired one of their commerical airliners (which flew a total of 3,675 flights) and they've retrofitted it as a Mid-century modern apartment. Parked at Amsterdam's main airport, the plane pied-a-terre is open to a select few guests through a contest with Airbnb (you must enter by November 20th). Even if you're not planning to go to Amsterdam anytime soon, it's incredible to see how much fits inside an airplane once the seats have been removed—in this case, a living room, a large bedroom, two kitchens and eight bathrooms. The cockpit has been converted into a lounge, where guests can sit and watch takeoffs and landings. The company also has a sense of humor about the project, stocking the cabin with flight-themed films like Snakes on a Plane and Top Gun and specifically banning "marshmallow roasting in the jet engines." To learn more and try your luck, see the Airbnb listing.